Sometimes, you’ve just got to do what you’ve got to do. A group of 20 industry mates supporting Perennial are making their way around the UK. They had last finished a ride at the top of Snowdon and needed to sort the next part of the trajectory-Snowdon to Lands End, of course. And so it was that Snowdon to Lands End was born. The route can be done as a whole over 6 days or divided into 2 sections – Wales and England. 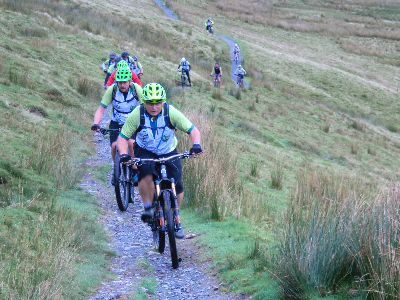 Mountain biking from Llanberis at the foot of Snowdon through Snowdonia and Brecon National Park, to Swansea as Part I. Part 2 was from Ilfracombe to Lands End along the Camel Trail, the Bissoe Trail and parts of the stunning South West Coastal Path. Cyclists make their own way to Llanberis to register with the pie team on arrival, followed by dinner and a briefing. After a hearty breakfast, we make our way over the Snowdonia National Park, whilst trying to spot the peak of the highest mountain in Wales, Snowdon. We make our way south towards the large man-made reservoir Llyn Trawafynydd before reaching Coed y Brenin, the UK’s first and largest dedicated mountain bike trail centre. After this stop, we head towards our accommodation for the night north of Machynlleth. Dinner will be served at the hotel, or in a local restaurant. We start the day by cycling through the Cambrian mountain range toward’s Devils Bridge Falls. 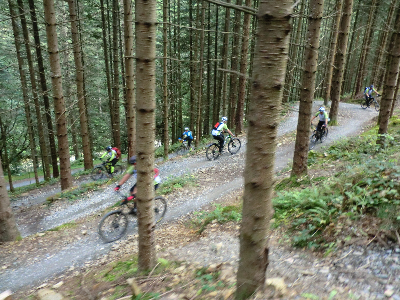 The undulating route follows forest trails and gravel paths throughout the day. You will also be cycling up and over the iconic Devil’s Staircase, where the route has a gradual decent into the village of Llanwrtyd Wells where we will be staying the night. The final day in Wales takes you through the Brecon Beacons National Park towards Swansea. Compared to the previous day’s rides, today will seem a lot easier with a gentle descent into Swansea as the route flattens out. After your final meal in Wales, you will be transported to Ilfracombe to your accommodation for the night, where you can dream of England’s green fields. After a lovely Devon breakfast, you set off from the harbour town of Ilfracombe riding along the coast towards Barnstaple. This is a hilly start to the day which flattens out as you cycle along the South West Coast Path. There are more hills as you get closer to Bude where we will spend night. Today is the longest day as it skirts around the edges of Bodmin Moor. The route will take you along the aptly named Camel Trail, which hugs the Camel River, offering a wonderfully scenic route. In the evening you will be staying in the surf capital of Cornwall, Newquay. You start the final day ride heading towards Truro. After this you will pick up the Bissoe Trail towards your lunch stop and a traditional Cornish pasty. As Penzance and St Michael Mount draw closer, so does the finish at Lands End. In the evening we will hold a celebration meal where friends and family are welcome to join you to toast your achievements.